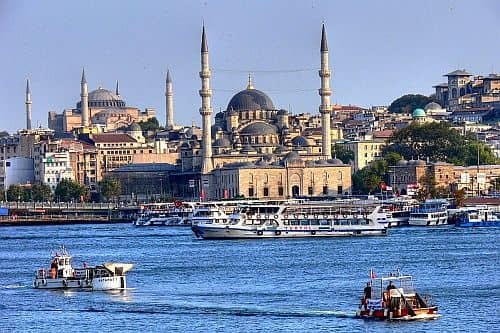 The climate of Istanbul, the largest city of Turkey, can be defined as transitional Mediterranean, in fact it has fairly cold winters, but otherwise it has Mediterranean characteristics: the rainiest seasons are autumn and winter, and summer is hot and sunny. Precipitation amounts to about 820 millimeters (33 inches) per year; the wettest months are December, January and February. Winter, from December to March, is quite cold: the average temperature in January and February is 6.5 °C (43.5 °F). In winter, there are mild periods, but also cold periods, when the temperature remains a few degrees above freezing (0 °C or 32 °F) even during the day, and a cold rain can fall, or even snow. In fact, snowfalls are not so rare, and occur more than once almost every year, accompanied by frosts, usually not intense. This chance of cold weather and snow is due to the proximity to the Balkan Peninsula, which in winter cools down a lot. March is usually quite cold and is often still a wintery month. The most abundant snowfall occurred on 3 March 1987, with 63 cm (24.8 in). In February 2015, the snow reached 75 cm (29.5 in) in the nearby town of Çatalca, belonging to the metropolitan municipality of Istanbul. Spring, in April and May, is mild, and sunny days become quickly more frequent, while the rains become rarer. However, in April it can still be cold, and there may be sudden changes in temperature, especially in the first half of the month. Summer, from June to August, is hot and sunny, and also quite sultry; the heat is felt especially within the city, while a relieving breeze blows from the sea. The average temperature in August, which is albeit slightly the warmest month, is 24.5 °C (76.5 °F). However, during the warmest months, July and August, and more rarely in June, sometimes the temperature can reach 35/37 °C (95/99 °F). The sky is mostly clear, although we can not exclude some downpours or thunderstorms, generally not intense. Autumn, from September to November, is initially warm and often sunny in September, but as the weeks pass the weather fronts of Atlantic origin gradually become more frequent: there are on average 5 days with rainfall in September, 8 in October and 11 in November. The amount of sunshine in Istanbul is scarce in winter, when cloudy skies prevail, and sometimes fog can form, while it is very good in summer, when sunshine prevails. The sea in Istanbul, very cold in winter, becomes warm enough for swimming in July and August, while it is still very cool in June, about 20 °C (68 °F), and all in all it's still acceptable in September, when it's about 22 °C (72 °F), as can be seen in the following table. The best times to visit Istanbul are spring and autumn, in particular the months of May, June and September. September is an interesting month, especially in the first half, usually pleasant and with little rain, and the sea is still warm enough. In July and August, at certain times the heat is acceptable, while at others it can be intense.